The connection between women’s economic participation and prosperity is undeniable. Over the past two decades, a growing number of international organizations and world leaders have recognized that the economic empowerment of women is critical to economic growth and stability. Multilateral bodies such as the Group of Twenty and the Asia-Pacific Economic Cooperation forum have ratified agreements to promote women in the economy as a means to stimulate growth, and governments from the Ivory Coast to Rwanda to Japan have adopted reforms to increase women’s ability to contribute to their economies. These developments have fueled mounting international recognition of the importance of women’s economic advancement to poverty reduction and economic growth, manifested most notably in the landmark Sustainable Development Goals (SDGs) adopted at the United Nations in September 2015. The SDG framework specific targets to improve women’s economic participation, including equality in property ownership and inheritance and access to financial services, natural resources, and technology—the first time for a global development agenda. The ways in which gender affects time use, human development, and access to assets and markets are too often ignored. Yet despite this growing recognition, national and international economic leaders continue to make and measure policy in ways that undervalue women’s work and do not capitalize on women’s economic participation. 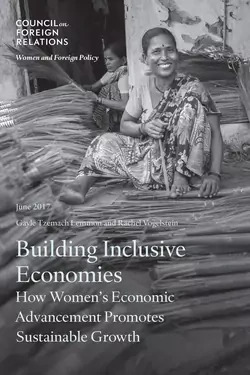 Serious proposals to address critical barriers that limit women’s economic contributions remain absent from mainstream economic policy discussions. The ways in which gender affects time use, human development, and access to assets and markets are too often ignored in policy dialogue. Women’s work in the informal economy and inside the home is uncounted or undercounted. Structural and cultural barriers continue to inhibit women’s participation in higher-wage sectors and occupations, and gender wage gaps persist everywhere in the world. The Donald J. Trump administration has expressed support for easing barriers to women’s economic participation and, correspondingly, should take steps to grow the U.S. commitment to unlocking their economic potential. Even in an era of tightening budgets, Washington can reprogram existing economic development funding to promote women’s economic empowerment as a tool to accelerate growth and reduce poverty. By strengthening its focus on women’s economic participation, the United States can improve the returns on its economic development efforts and promote cost efficiency by investing in a proven driver of economic growth. At the bilateral level, the United States should provide incentives across its foreign assistance programs to tackle legal barriers to women’s economic participation. It should use its influence on the multilateral stage to help eliminate legal barriers to women’s economic inclusion and promote women’s economic advancement. The U.S. government should create a public-private fund to develop innovative approaches to improving women’s economic participation. The United States should also partner with the private sector to expand recent efforts to source from women-owned businesses. The U.S. government should invest strategically in existing timesaving technologies for households in developing economies—including clean cookstoves, wells and pipe water, and electricity—and collaborate with the private sector to create and promote innovative approaches to reduce the burden of unpaid work on women and girls. It should increase investment in programs that support women’s entry into growing science, technology, engineering, mathematics (STEM) industries. The U.S. government should work with the International Labor Organization, the Bill and Melinda Gates Foundation, the National Transfer Accounts Project—which gathers global data on informal work—and other partners to lead comprehensive efforts to close the economic gender data gap and analyze women’s unpaid care work and informal economy activity. The U.S. government should lead by example by developing domestic policies to advance women’s economic participation at home, including through enforcement of U.S. antidiscrimination and equal pay laws, among them Title VII and the Equal Pay Act; expanded support for quality, affordable childcare and eldercare; tax reform to eliminate the penalization of dual-income families; and the development of a paid family-leave program, given that the United States is one of only nine countries in the world without such a policy.